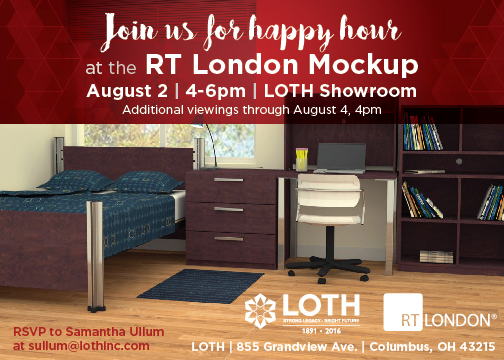 Join us for happy hour at the RT London Mockup in the LOTH Columbus Showroom! The event begins August 2 from 4-6pm and additional viewings can be scheduled through 4pm on August 4. RT London is an educational furniture company bringing a resident hall bedroom mockup to our space along with some of their lounge options. Contact Samantha Ullum at fhyyhz%25ybguvap%23pbz@no-spam.com for more information.